tire gloss agent with a high gloss, durable good. Limpid liquid Silcone formula through it. Tire construction has after splashing water, weathering resistance, and resistance to pollution. Bright durable, suitable for a variety of tire maintenance. Leather chairs, plastic and so on can be used, easy to use and fast. the tire light agent to add a special resin. Construction is complete with the film. May form a valid protective film after the construction of the object on the surface. 1. can be used as a spray, tire brush, sponge, clean cloth. 2. take appropriate tire light clean agent in maintenance of object surfaces. 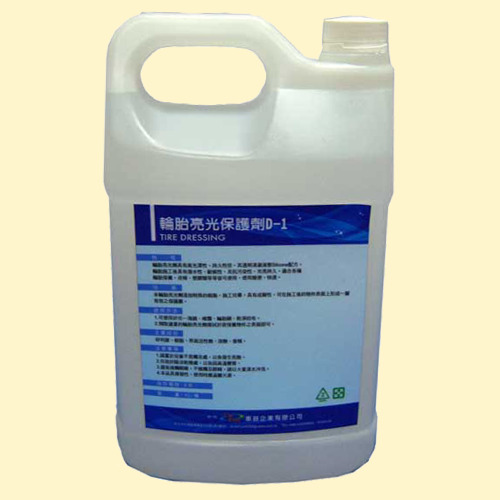 Silicon likang, resin, surfactants, solvent, flavoring. 1. Please place away from children, avoid danger. 2. store in a cool dry place to avoid high temperature metamorphism. 3. avoid contact with eyes, accidentally touched the eyes, please rinse heavily. 4. this product is volatile, when used away from sources of ignition.